Sweaty and storming one day and then dry and, like, ten degrees cooler the next. While we don’t really experience much of the transitional season weather-wise, Brisbanites have been #blessed with some fresh autumn menus guaranteed to get you right in the pumpkin-spiced feels. We all know this Paddington institution for its unbeatable seafood, but did you know that plenty of dishes on their menu change seasonally? Instead of gambling with your autumnal feast, grab some of Gambaro’s current standouts, including roast shiitake mushrooms with Jerusalem artichoke, gorgonzola, and walnuts, Earl Grey and citrus-cured salmon, and grilled scallops with squid ink cauliflower and chocolate chilli butter – fall me up, fam. Dietaries? No worries! Nodo’s seasonal menus cater to literally every dietary requirement and preference you could dream of, and their autumn release is no exception! Wrap your lips around a Violet Crumble Dutch waffle with pumpkin custard, neighbourhood honeycomb, persimmon curls, cacao mousse, creme fraiche and citrus. If you’re more of a savoury bruncher, the miso mushrooms on porcini crumpet with chilli scramble, wattleseed jam, and black garlic butter are sure to stun, hun. We’ve come to expect stunners from Bacchus’ head chef, Massimo Speroni, and his newly released autumn menu is no exception! A new mushroom dish features bottoni pasta filled with mushroom, marjoram, and smoked mozzarella, and served with mixed mushrooms, mushrooms broth, and red elk leaves. Mushroom for more? There’s also whole quail with pumpkin, seeds and sage, and Champagne lobster in chardonnay sauce to round out your seasonal feasting in Bacchus’ thoroughly autumnal dining room. The perfect spot to snuggle up as the weather turns, Salon de Co’s new menu took two chefs (head chef in residence Andy Ashby, plus Ovolo Hotels’ culinary partner Ian Curley) to devise, so you know it’s good! 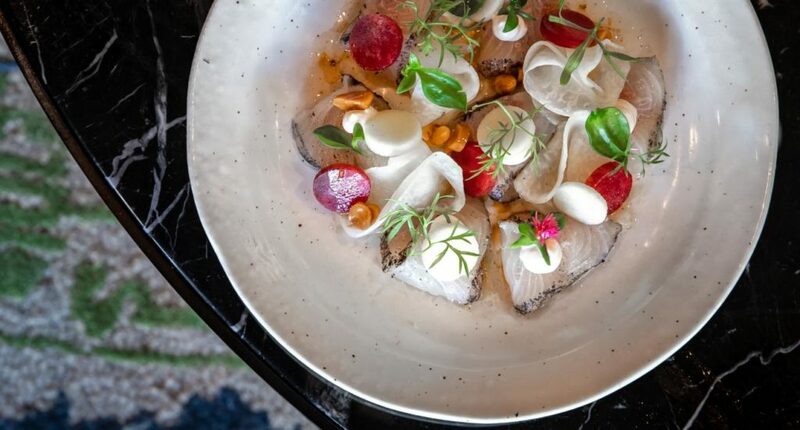 The seasonal flavours filling the pop art-injected venue include Queensland spanner crab with burnt butter and macadamia, tea-smoked duck with rosella and beetroot, and a dessert of feijoa, white chocolate, and coconut. They’re taking it back to Puglia with this one! Chef and owner Cosimo de Nichilo has plated up an autumnal feast, including the Taste of Puglia board (with burrata, capocollo, mortadella, pistachios, and pane di Altamura) and a traditionally Pugliese orecchiette dish with broccoli, garlic, Italian salsiccia sausage, and plenty of parmesan. Go on, grab another pinot and pretend the leaves are orange outside. This suburban superstar goes full fancy on Milton Road, and their autumn menu is a fall feast on the visuals and palate. 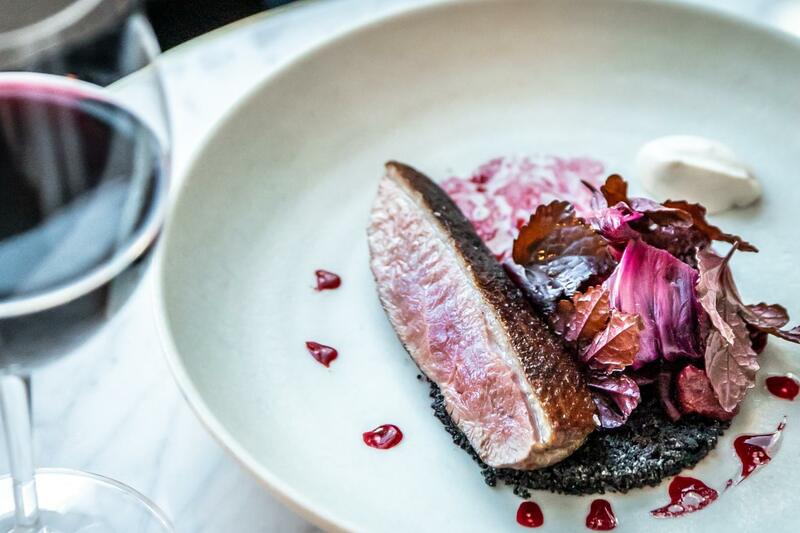 The sous vide duck with pear cream, caramelised peach, blackberry gastrique, native lime and nuts is an autumnal walk in the park, while the salad of prosciutto, witlof, orange, chevre, riberry, mint, raspberry balsamic and truffle pearls takes salad and makes it spesh. What’s for dessert? We’re autumn-atically drawn to the mulled wine panna cotta with pistachio meringue, rhubarb curd, poached pear and Scottish shortbread. The team behind The Glen Hotel and Osbourne Hotel have created a space that takes you to a lush and verdant oasis as soon as you enter, and their flawless autumn-inspired menu, carefully curated by head chef Brad Casey, boasts an array of seasonal produce and flavours. Start with an entrée of tempura Moreton Bay bug (hallelujah! ), before moving on to the signature duck breast with parsnip, asparagus, carrots, sweet onion lychee jam and red wine jus. Pair your food with the crowd favourite Lily Blossom cocktail and you’re guaranteed to be dreaming of orange leaves! There’s more than one perfect pear in the kitchen at this Brissie institution! The first menu release from chef Andrew Gunn (newly returned from France) and his partner, Amélie Rabaud (executive and head chef respectively), Urbane’s autumn offering is set to continue the venue’s impressive rep. Fall for seasonal plates like seared scallops with cauliflower puree, miso butter and crispy kale, honey glazed pumpkin with hummus, cous cous and ricotta, and braised pork belly with kimchi salad and nashi pear. Time to bring the #fallvibes to your Insta-feed! Morning After’s new menu is full of seasonal flavs, like the peanut butter waffle with banana ice cream, seasonal berries, strawberry dust, meringue and maple (guess it’s waffle season?). For those who can ignore their sweet tooth (props), the autumn leaf salad of pumpkin, carrots, turmeric hummus, beans and lemon citronette is sure to be as satisfying as a pile of crunchy leaves, while the truffle scrambled eggs with wild mushrooms, hazelnuts, basil pesto and pecorino on toast has us falling for this cafe fave all over again. We’re ready to embrace our autumn body (it’s a thing, ok?). - the gourmet who just wishes it was winter already.